Hiraizumi (平泉, ) is a small town in Iwate, in the northeastern Tohoku region of Japan. During the reign of the Fujiwaras (866-1184), Hiraizumi was said to rival Kyoto in grandeur and sophistication, but now all that remains are the temples of Chusonji and Motsuji, both of which are mostly in ruins at that. Famed haiku poet Matsuo Basho penned the famous haiku quoted above, with the end result that now Basho is quite possibly more idolized in Hiraizumi than anywhere else, and you can't throw a rock in Hiraizumi without hitting a Basho statue, a Basho monument, an inscribed copy of a Basho haiku or at the very least a coffee shop waving its "As mentioned in Narrow Road to the Deep North!" banners. Hiraizumi is on the JR Tohoku Main Line, connecting to Morioka in the north and Sendai to the south. The nearest Shinkansen stop, Ichinoseki, is only 10 minutes away (¥170). Trains from Tokyo reach Ichinoseki in about 2 1/2 hours (¥12,470 for the one-way trip to Hiraizumi; no charge with the Japan Rail Pass). Local buses connect JR Hiraizumi station to points of interest, although you can also reach them on foot. Bicycle hire is available just to the right of the station, it is ¥1,000 for the whole day (lesser periods are available) it allows you to get around quickly and enjoyably. In 2011, six of the city's attractions were made World Heritage Sites under the name "Hiraizumi - Temples, Gardens, and Archaeological Sites Representing Pure Land Buddhism". 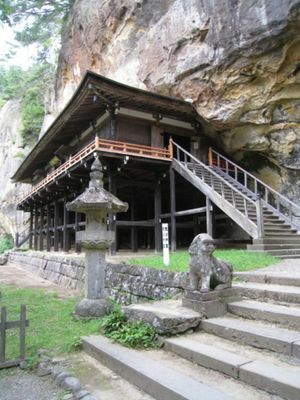 Those sites are: Chuson-ji, Motsu-ji, Kanjizaio-in Ato, Muryoko-in Ato, Yanaginogosho Iseki, and Mount Kinkeisan. There are a number of small teahouses and souvenir stands in the grounds of Chūsonji. Regrettably, Motsuji's well-known temple-run youth hostel was closed in 2007. This page was last edited on 9 September 2015, at 18:42.